Innovation and modernity meet professionalism and merit!!! Managing a championship is not as simple as it seems. The complexity and criticality of management administration of international level competitions are just around the corner. 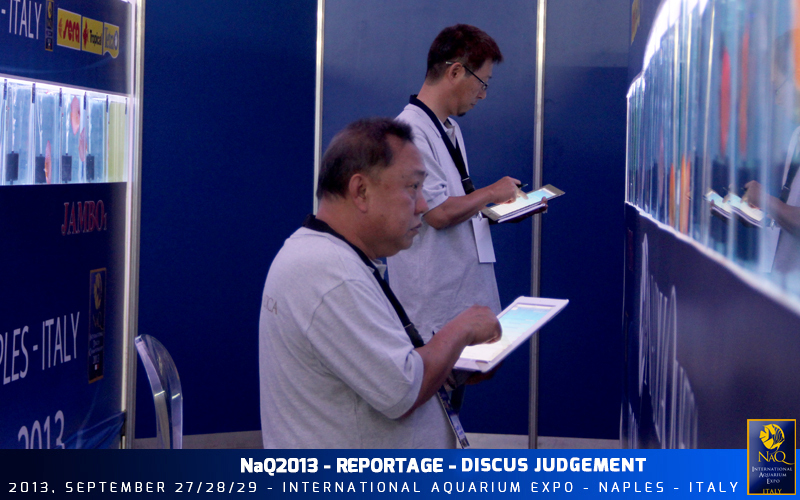 Napoli Aquatica is a modern event and as such, could not make use of modern tools for its management. 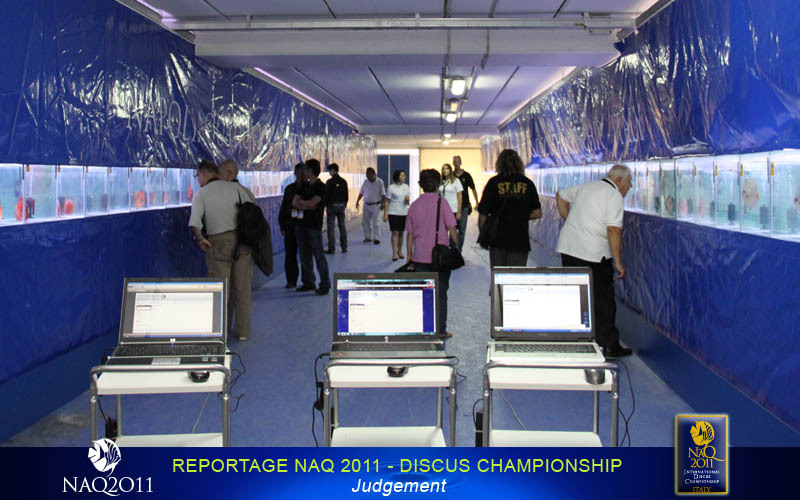 The key person in this process is Ruoppo Vitale (www.VitRuo.it) who deals with many tasks in NaQ and also takes care of one of the most innovative things, that’s to say the system of judgment and management of the Discus Contest that I will now try to explain. 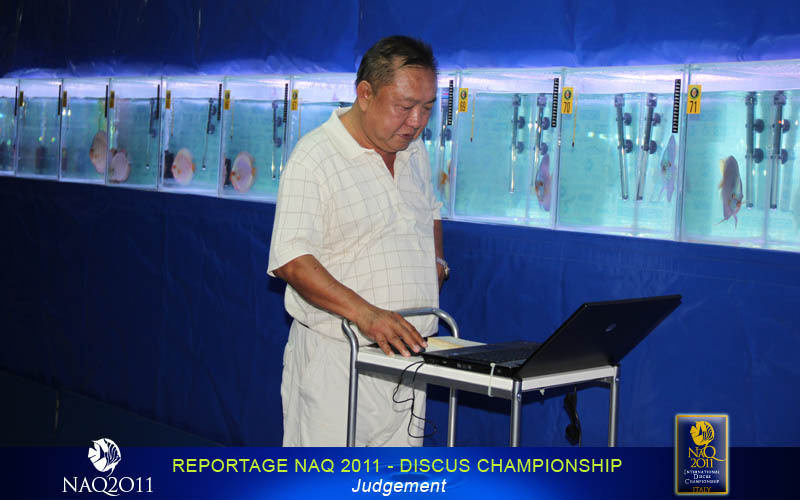 In 2010 the judges were 10 and 160 the discus in competition, it was our first year and we were confronting with a competition so extensive and complex. That year the procedure of judgement took place in the traditional way, that's to say with pen and paper. I remember well we had to manually enter them in a spreadsheet for counting points. I would say it was disarming. The results of the competition and the definition of the winners could not take place earlier than three hours after the end of the judgement. We must not forget the two critical phases of check-in and check-out. I can say that it was hard. 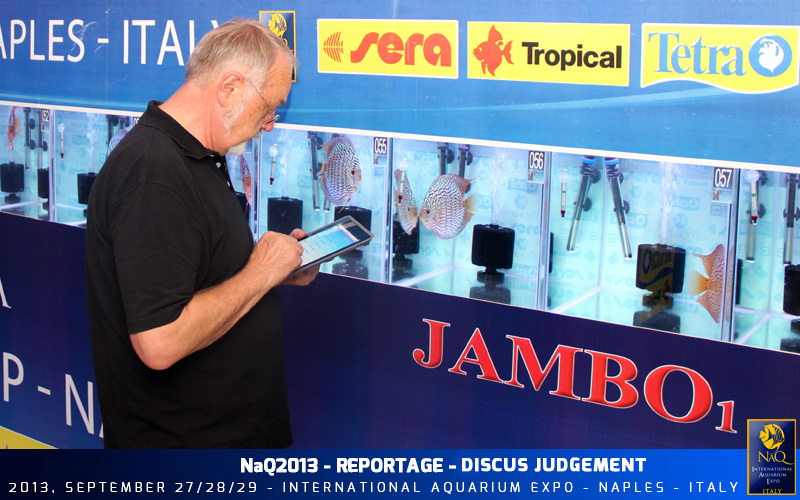 In 2011, Vitale Ruppo developed a web application that could control the totality of the difficulties during check-in and check-out phases with the registration of owners, fish, tanks and assignment in the specific category, through the release of a paper receipt attesting the ownership of the discus registered for the competition. In that year the judges voted with laptops connected to a server via a local network. 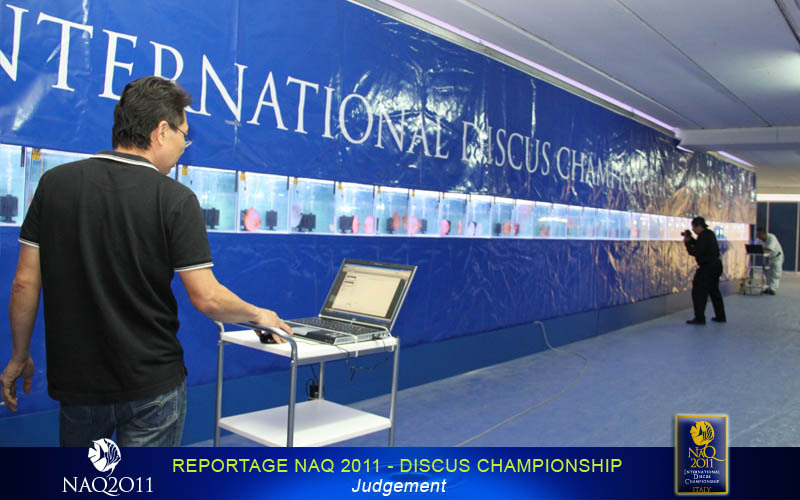 The server had the ability to monitor in real time the work done by the judges and store the judgements expressed. 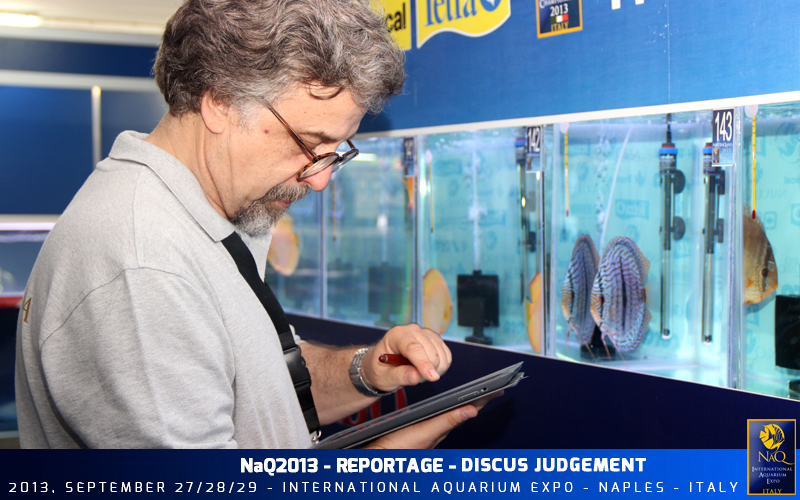 At the end of all the judgment, we only had to query the data store to find the rankings of fish divided by category. This system managed to fix and speed issues related to the phases of check-in and check-out, and the web application in question also solved another critical issue of fundamental importance for a competition, that is to be able to check and verify that all the judges had voted all the fish in the competition. This system, although most handy and advanced, had 2 major handicaps. The weight of laptop computers forced us to place them on tables with wheels, thus reducing its ease of use. The laptops had to be necessarily connected to the power because the batteries did not allow 5 hours of continuous work. Therefore, tables to be pushed and extension cables on the ground gave us the need to look for new solutions. 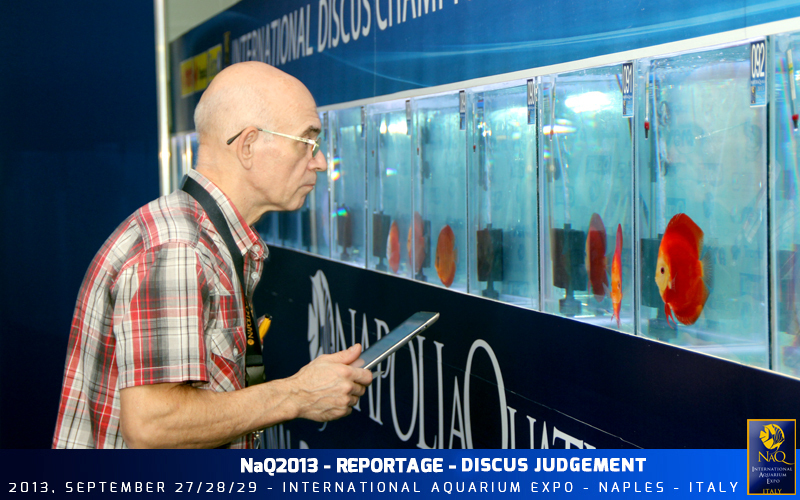 In Napoli Aquatica 2013 the judging system was decisively improved. Eliminating laptops, we adopted the comfortable, modern and lightweight iPads, with an app developed "ad hoc" by Vitale. 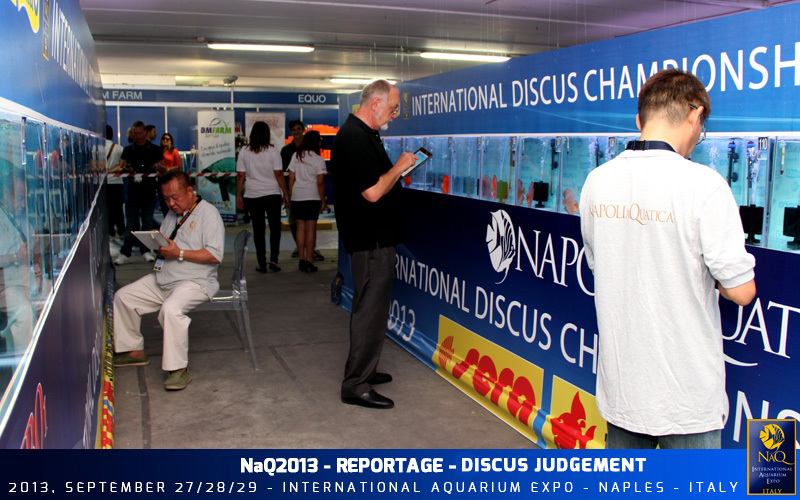 An application suited on the specific needs of Napoli Aquatica that would meet the complex needs of an international discus championship. The iPads have solved the difficulties related to the weight of the laptops, there was no need to carry them on the tables and also the difficulties related to the batteries were solved, they had not to be connected to the power, eliminating thus those annoying cables between the championship lines. 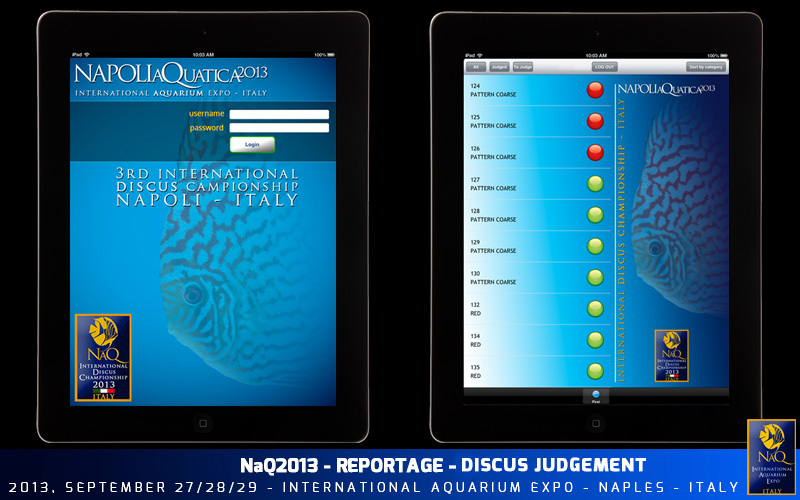 Let's go back and examine in depth the iPad app, designed and developed by Vitale for Napoli Aquatica and its complex requirements. It was used in the judgement stage easing greatly the work of the judges, making it a less tiring experience. 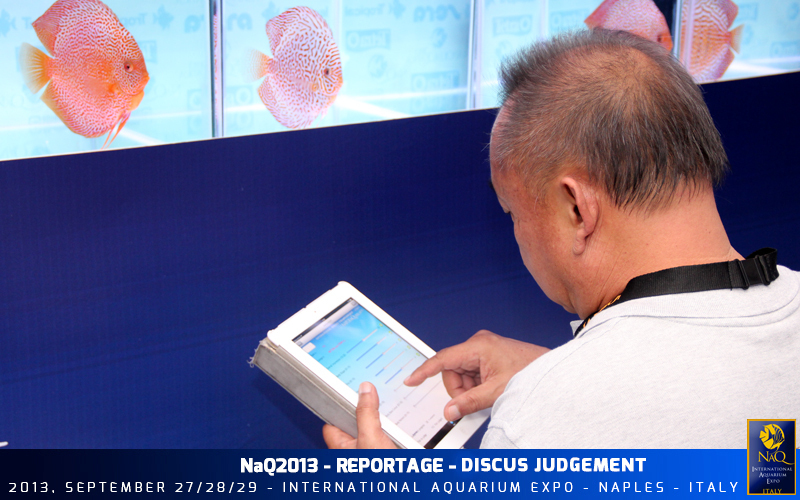 The app has been equipped with features that allow the judge to always have control of the situation In fact, the judge may filter, and display, fish among those already voted, still to be voted or simply by the assigned category. It is possible to vote all fish belonging to a specific category one after the other. 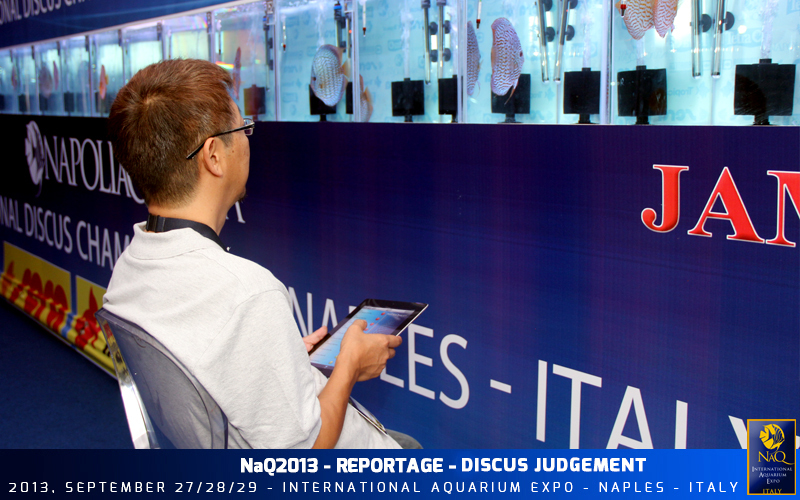 The application makes easy for the judges the insertion of the single vote with an object (button) which, dragged from left to right, increases the score and vice versa. The system prevents the judge from any mistake, having a preset range for a specific parameter. If a certain judging parameter must be minimum 10 and maximum 20, the judge will not be able to make mistakes by entering a 9 or a 21. Furthermore, the application verifies that all parameters have been effectively exploited, and then judged. The app allows you to change the judgement already given and so, with a simple procedure, allows the judge to be able to go back to that screen and modify the judgment. Another advantage is that the app allows you to re-categorize the fish. In this way it is not necessary that the fish of the same category are in adjacent tanks. If the judge wants to vote in a consecutive manner all the fish in a specific category, it is possible to select in the app the desired category. This way the app will show the numerical list only of the tanks in the requested category. If a judge thinks to have finished his/her work, and for a distraction, forgets the judgment of even a single specimen, the system will report the inconsistency. Under each screen of judgment there is an indication of the percentage of votes compared to the overall progress already made. This kind indicator allows the judge to orientate and to foresee the time required to finish the whole voting process. The final result is that Vitale was able to make it look simple and relaxing such a complex operation as the management of an entire contest from an administrative and management point of view, monitoring and controlling possible errors.